Community First! Village, the subject of his documentary currently production from director Layton Blaylock, permanently transforming lives of homeless people, allowing them to heal from the ravages of being on the streets and helping them to rediscover a purpose in life. It is not a shelter-- everybody pays rent. They are given opportunities on-site and off to make a dignified income and learn new skills. There is no place like this in the world. Blaylock is known also for his 2006 award-winning documentary Art From the Streets. 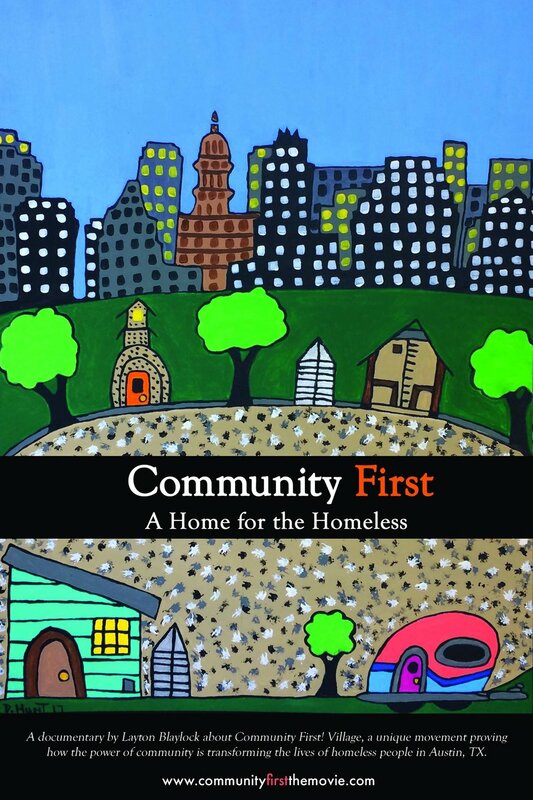 Upon its release, AFTS suddenly had a national audience committed to its success and replicating the concept to help other homeless folks heal through art programs across the country. CFV is a new, effective model that needs to be shared with the rest of the country, and that’s precisely what they plan to do with this film. *Poster art by former AFTS participant and CFV resident Penney Hunt.